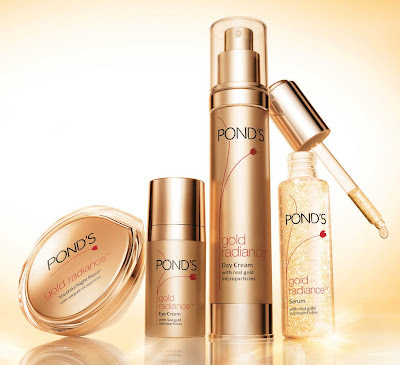 For over ten decades Pond’s has always been in pursuit of delivering beauty transformations through revolutionary product innovations that make a real difference to women’s skin and the way they live their lives. Addressing the constant evolving needs of women in skin care, Pond’s continues to strengthen their research to provide them with only the best skin care solutions. Today, age management is a growing concern among women on a global scale. Many women feel that even with clear skin their face looks dull. Addressing this concern is the newest and most natural anti-aging ingredient, which recently became a popular craze in Asian countries like Japan and India. Throughout history, gold has been used for its luxurious and beautifying properties and as well as treatment of skin problems dating back from the Ancient Roman times. Gold was also part of ancient Chinese medicine, and was used to achieve a more youthful appearance. Gold can improve skin elasticity and at the same time give instant youthful radiance to the skin. Gold facial treatments are considered by women as healthier and more natural alternative to abrasive surgical and laser procedures. Only the most luxurious spas in the world offer gold facials, as pure gold particles are used that make it an expensive treatment. With its promise of making beautiful and youthful skin easy to achieve for women, Pond’s introduces Pond’s Gold Radiance, another breakthrough that brings this luxury into your own home. Pond’s Gold Radiance with real gold micro particles blends into skin to boost radiance. The formulation is designed to work beyond the surface to stimulate skin renewal. Gold, along with the leading anti-ageing ingredients, is used at the right level to brighten skin without leaving an obvious residue such as a glittery finish on the skin. Pond’s Gold Radiance uses 98.5 % real gold specially developed for use in skin care. Time robs skin of radiance, making it lifeless and dull. The new Pond’s Gold Radiance helps women bring back that glow in their face they had back in their youth and addresses mature skin that’s dull, losing energy and vibrancy affecting their confidence. It optimizes the four dimensions of radiance: skin tone that is clear and even; skin texture that is elastic, soft, and smooth; skin color that is fair and translucent; and skin hydration having a dew glow as a result of optimum moisture levels. Pond’s Gold Radiance has been clinically tested by dermatologists and certified as hypo-allergenic. Recapture the radiance of your youth with Pond’s Gold Radiance. Step out from the dullness and fear of losing that radiant vitality you once had. With this new revolutionary product from Pond’s, gain back that confidence and romance into your life again with radiant, glowing, and youthful skin.